Life has been breathed into a dormant Southbank development site with Hampton East-based BPM on the verge of proceeding with a reworked development scheme located at 105 Clarendon Street. Designated Shadow Play, the tower sitting on a 1,260sqm site will feature 52 levels of apartment living above a 9 level podium; both of which will carry a subtle rippling facade to which the project's name references. Designed by Elenberg Fraser and with internals by Hecker Guthrie, Shadow Play is expected to hold 150 car spaces within the podium and 546 apartments within the tower above. While a restaurant may be the ground level drawcard, Shadow Play's top floor will host an entire resident amenities level. 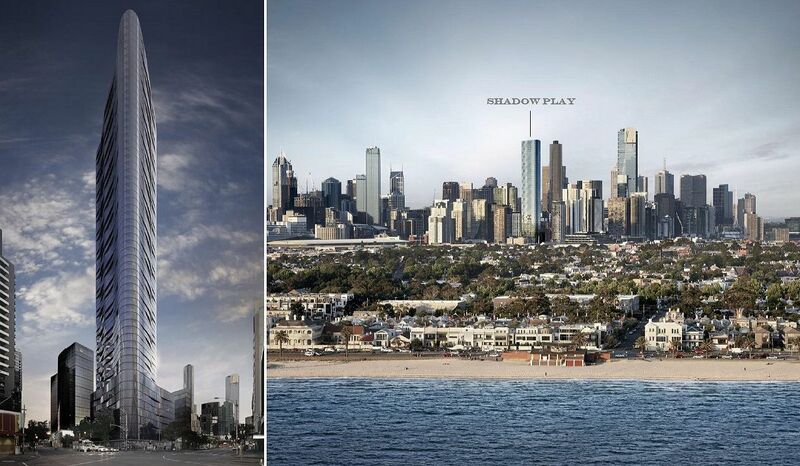 Standing tall on the corner of City Rd & Clarendon St, ’Shadow Play’ will form a landmark ‘gateway’ to Melbourne’s South Melbourne and CBD. Constantly morphing and changing as the viewer moves around the building, the sculptural form creates a beautiful ephemeral experience. Undulations in the façade give the illusion of movement across the building skin whilst also practically working to maximise views out across Melbourne. The podium design is activated through residential apartments to the Clarendon St and City Rd corner. A layered and semi-transparent articulated mesh is stretched across the main corner of the building which is designed to provide privacy to the apartments and allows for a highly effective natural ventilated car park to Haig Lane and City Rd. Working in harmony with the natural environment ’Shadow Play’ will create an iconic & animated sculpture for the city of Melbourne. As mentioned Shadow Play will replace the approved scheme onsite also devised by Elenberg Fraser. Approved during September 2011, the tower consisted of a 42 level, 133 metre high residential complex with three ground floor retail tenancies and above ground parking through the podium. With a GFA of 37,000sqm the then 308-320 City Road would have contained 360 one and two bedroom residential apartments. 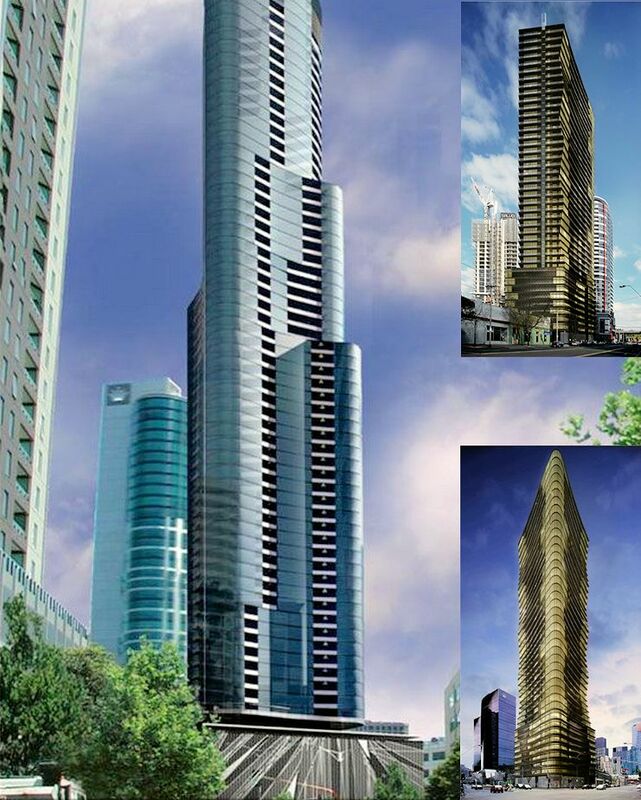 Readers with an even longer memory may equate the current Shadow Play design to that of architect Ivan Rijavec's early Prima Tower design seen below. While there's more than a decade between the two, both carry splaying 'wings' of sorts emanating from a rounded leading form, producing a very agreeable outcome. Shadow Play represents a sizeable leap in project scale for BPM, with low and mid-rise residential projects their forte to date. Collins & Queen in Essendon represents BPM's largest Melbourne project with 111 apartments and 6 retail tenancies currently under construction. Nonetheless BPM look to be on a rapid expansion curve with Shadow Play joined by pending Richmond, Collingwood and South Melbourne projects, in addition to three Brisbane apartments developments in the pipeline. Shadow Play's project briefing suggests the tower is aiming at a 2018 completion date. As discussed on the forum thread there are 60 levels in total visible in the render, for an estimated height of 180-190m. That would consist of the quoted 52 levels of apartments above a 9 level podium with 1 level of plant at the top, given an average 3m+ floor-to-floor average height. And a much more beautiful building as a result. It's market demand there is still plenty of traditional apartments being built elsewhere in Melbourne with large balconies for people who want that. As for floor to ceiling heights we don't know exactly what they will be and not sure what you define as 'low' but a 3m floor-to-floor height would give a ceiling height no different to the majority of other apartments in Melbourne. As for cross-ventilation exactly how many apartments out there have ever been build with windows on both sides of the unit to allow true natural flow of air through the unit ? Missed opportunity to go with 50 Shades of Play. So just to clarify, does this still need approval from the minister, or has this amended design been approved without fanfare and is ready to proceed? Actually not sure on this one as yet. Nothing coming up on the registers although the project PDF is complete with apartment pricing and BPM have the project on their website.